Recently it was National Chocolate Chip Cookie Day. When you hear that, how can you NOT bake cookies – chocolate chip cookies! We decided to update our original gluten-free chocolate chip cookie, to make it a bit healthier. I switched out some of the flours and added in coconut oil over the butter. A few more small tweaks and we had a new delicious cookie in our hands. At our house, they didn’t last long! Here’s a chocolate chip cookie you can eat with little guilt. They will make a good addition to school lunch or an afternoon snack. 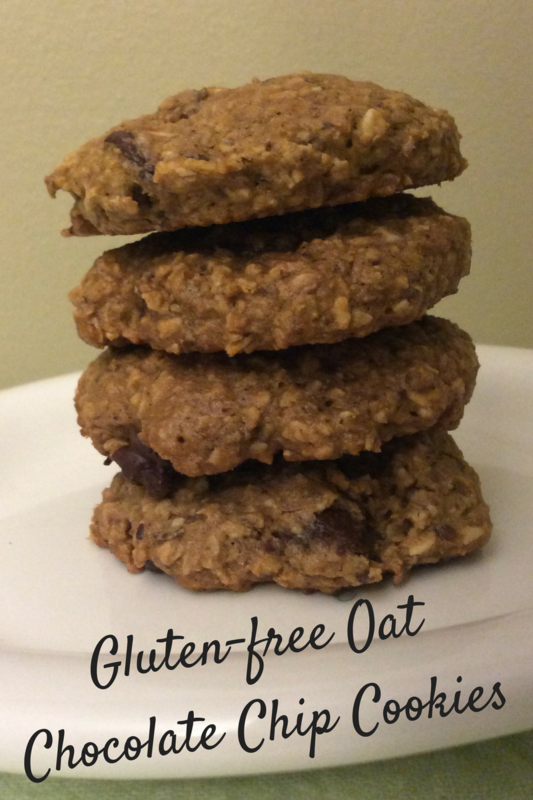 The oats make them a bit heartier, and add in a touch of good nutrition. Try it out and see how you like them! In a large bowl, whisk the eggs with the applesauce, coconut sugar, vanilla and maple syrup. Measure the flours and flaxseed into another bowl. Add the guar gum, baking soda and salt and mix well. Add the flour mixture to the wet ingredients. Then, pour the melted coconut oil on top and stir to combine. Spoon the dough onto baking sheets, spread out evenly. Flatten into small circles with wet fingers. Bake for 6 minutes, turn cookie sheet around in the oven and bake for another 6-7 minutes, until lightly browned. 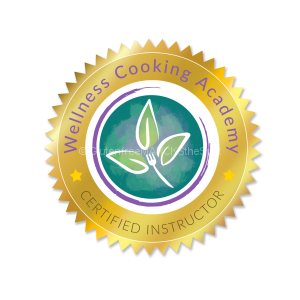 *You can easily make oat flour by grinding your oats in a food processor. **If the dough is too wet, add a couple more tablespoons of oats to the mixture – not too much as it will dry out the cookie. 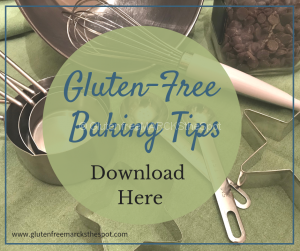 Want more fun and easy gluten-free recipes? 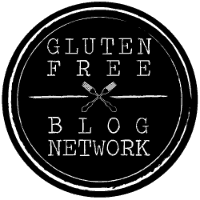 and information on healthy, gluten-free living! 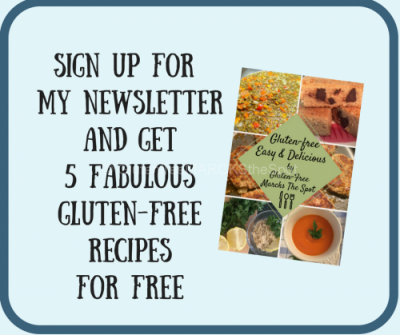 and get 5 Free Easy & Delicious Recipes right away! 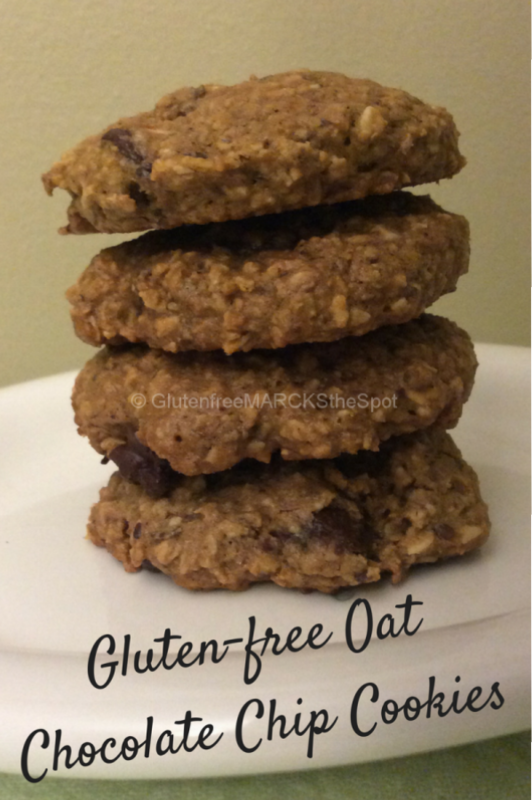 This entry was posted in Recipes and tagged gluten-free cookies, gluten-free oat chocolate chip cookies. Bookmark the permalink.